Campaigners looking to clear the name of Britain's last convicted witch may apply for a judicial review. 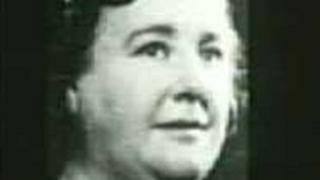 Spiritualist Helen Duncan was convicted in 1944 under the Witchcraft Act for fear she would reveal military secrets during World War II. Miss Duncan, from Callander near Stirling, was arrested in Portsmouth alongside three members of her audience as she conducted a seance. In 2008, the Scottish Parliament rejected a petition to pardon her. Almost 70 years after an Old Bailey jury found her guilty, campaigners maintain Miss Duncan was wrongfully convicted. Graham Hewitt, who is fighting the case on behalf of her grandchildren, said: "She was tried under an old piece of legislation that shouldn't have been used at the time and advice had been issued by the Director of Public Prosecutions that alternatives were available. "Winston Churchill even described the whole episode as 'obsolete tomfoolery' in a memo to the then Home Secretary Herbert Morrison. "She was viewed as a potential threat by the authorities back then. "They feared what she was telling people might lead to a crisis in the security services or to soldiers defecting." Miss Duncan had been invited to Portsmouth in 1941 by a local church to demonstrate her abilities of spiritual materialisation. At a seance, she reportedly summoned the spirit of a dead sailor who lost his life alongside 800 others during the sinking of Royal Navy warship HMS Barham. It was sunk by a German U-Boat in November 1941, but had not been declared officially lost until the following January. The government had chosen to keep it secret in order to mislead the enemy and maintain morale. On 19 January, 1944 another séance in Portsmouth was interrupted by a police raid where she and three members of the audience were arrested. She was eventually tried by jury at the Old Bailey and subsequently found guilty of contravening section 4 of the Witchcraft Act of 1735. Mr Hewitt, who is also assistant General Secretary of the Spiritualists National Union, said: "The Criminal Cases Review Commission wouldn't reopen the case as they said it wasn't in the public interest. "But, we have to continue the battle and believe there's a strong enough case to clear her name."